My mother died when I was one month old. A host of caring relatives helped bring me up. Among them, I loved my mother’s mother the most. She showered me with affection and always counselled me to never stray from the path of virtue. Easily the most spiritually inclined person in our family, my maternal grandmother was devoted to Krishna . Come every Saturday evening, she would go to her guru’s asrama in North Kolkata, to participate in three hours of kirtana, a spiritual practice involving the congregational chanting of the mahamantra: Hare Krishna Hare Krishna Krishna Krishna Hare Hare Hare Rama Hare Rama Rama Rama Hare Hare. Enjoying my school holidays at her house, I would often accompany her on these weekly kirtana sessions. “How patiently he sits through the entire three hours,” my grandmother’s kirtana friends would admiringly comment. I did like the kirtana. But I liked the batasa, the sugar drops doled out after the kirtana even more. Securing top marks in high school, I would enter a prestigious engineering college and accelerate to a glittering corporate career and beyond. This was my father’s dream. I did secure pretty good marks in my school leaving examinations. But that’s where my father’s dream and I parted company. My father, in fact, was partly to blame. Wanting to foster proficiency in English, he encouraged me to listen to BBC radio and read the works of celebrated novelists. I did both. The result was not entirely unexpected – I developed a taste for a cosmopolitan intellectual life. By the time I was in my last year at school, I was far more interested in entering the world of art house films and literary masterpieces than the world of engineering. To keep the peace at home, I chose to pursue Economics at a university well known for politics, bohemian parties and maverick intellectuals. I wasn’t particularly interested in Economics. But I figured that I would have to invest very little time to complete an Economics degree, leaving me free to pursue my real intellectual interests. It was during my first year at university that I began to identify as a Buddhist. It all started when browsing through a favourite book store I picked up a contemporary presentation of Buddha’s teachings by a Tibetan monk. The book confirmed my budding intuition that human life divested of the active pursuit of spiritual enlightenment was a bleak and boring affair. Caught in the web of karma, living beings transmigrate from one body to another, revolving in the cycle of samsara, the cycle of repeated birth and death. By following the Eightfold path, the path Buddha taught, we can escape this cycle of repeated birth and death and attain nirvana, a state free from all suffering. To tread the path to nirvana is the goal of human life. I was sold on the Buddhist presentation. Even though born into Hindu culture, I had encountered no definitive wisdom behind the colourful medley of rituals and festivals my Hindu upbringing had exposed me to. Buddhist teachings, on the other hand, seemed to offer something that was both pragmatic and philosophical. They validated my longing for transcendence and persuaded me to stay away from the reckless hedonism fast becoming embedded in the fabric of urban India. If I had the potential to experience Buddha nature or nirvana, then why was I not experiencing that state now? This question would often haunt me. According to the Twelve Nidanas, foundational teachings common to both the Theravada and Mahayana schools of Buddhism, the origin of my suffering – my entrapment in the repeated cycle of birth and death – is due to ignorance. But this answer leads to the inevitable question: Who or what is the origin of ignorance? Moreover, why have I come under the influence of ignorance? If ignorance is currently obscuring my pristine awareness of reality, it implied that ignorance had power over me; it implied the existence of a power greater than me, a power that was controlling me. Who or what was the origin of this power that was controlling me? 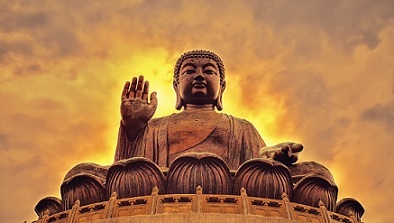 Buddhism, of course, could give no answer to these questions because the Buddha was famously silent about questions regarding ultimate origins. Li: My life is departing. I’ve only one breath left. Yu: Use your last bit of strength to meditate. Free yourself from this world as you’ve been taught. Let your soul rise to eternity with your last breath. Don’t waste it on me. Li: I’ve already wasted my whole life. I want to tell you with my remaining strength, that I love you, I always have. I’ll drift next to you every day as a ghost just to be with you. Even if I was banished to the darkest place, my love will keep me from being a lonely spirit. Will experiencing the ultimate Buddhist goal of nirvana dissipate the ubiquitous clouds of loneliness? Does the state of nirvana allow for exchanges of love? To this question, Buddhism offers another dose of silence. When it comes to describing the state of nirvana, different Buddhist schools agree on one thing and one thing only: it is indescribable. This uncertainty if (and how) love is expressed in the state of nirvana leads to a compelling question: Why relinquish our mundane experience of love – flawed and temporary as it is – to enter a state where we are not sure we can experience what we desire most: loving relationships? Does the promise of a lovebarren eternal state free from suffering override the promise of romance in a world full of suffering? For Li Mu Bai it certainly didn’t. Could I confidently say that I was any different from Li Mu Bai? I could not. In 2004, I arrived in New Zealand’s capital – Wellington – to pursue a masters degree in Environmental Studies. I envisioned a career as an environmentalist working for an NGO, a career that would be an expression of the cherished Buddhist virtue of compassion. By the middle of 2005, my course in environmental studies had introduced me to the rampant social and ecological injustice prevalent in the world. However, by this time, I was doubtful whether working for an NGO would enable me to do what I wanted to do most: address environmental problems from a spiritual perspective. Confused and depressed, I would pray to Lord Buddha before going to sleep every night, asking him to clarify the direction of my life. Lord Buddha answered my prayers, albeit in an unexpected way. I was walking back to the student hostel from university one evening, when an Asian girl stopped me and asked: “Are you from India?” “Yes,” I replied. Promptly, she handed me a Bhagavad-gita As It Is and asked me to buy it. For a few months prior to this encounter, I had been contemplating visiting South Korea to pursue my interest in Korean Zen Buddhism. And here was a South Korean girl asking to me to buy Bhagavad-gita, a book from my homeland. Thoroughly intrigued, I bought the book. Sevamrta Devi Dasi, my South Korean benefactor, invited me to check out Gaura Yoga, a yoga centre she was part of. One evening, a few days later, I did. Combining elements of a cafe and a yoga studio, the place exuded an uplifting energy. There was a workshop scheduled for that evening. It started with kirtana, the same Hare Krishna mahamantra I had grown up with at my grandmother’s asrama. Tears of relief ran down my cheeks. I felt I had finally come home. I started reading the Bhagavad-gita As It Is soon after first visiting Gaura Yoga. In the Gita, Krishna describes himself as the original, eternal, self-existent person from whom everything emanates. Krishna possesses innumerable energies, of which three are primary: the material energy, which manifests, innumerable material universes; the spiritual energy which manifests the spiritual reality; and a marginal energy which comprises innumerable infinitesimal spiritual beings or souls. In their pure state, souls relate to Krishna in a reciprocal relationship of ever-increasing love. But love can only exist when it is freely given. Being marginal energy, souls are minutely endowed with all the qualities that Krishna possesses in full. We are endowed with a minute portion of the independence which Krishna possesses in full. By misusing this independence, we can choose to turn away from our eternal relationship with Krishna and embark on an agenda to control and enjoy separate from Krishna . Krishna manifests innumerable material universes to accommodate those rebellious souls who choose to do so. In the material realm, our pure consciousness is covered by maya, Krishna ’s energy of ignorance. Under the influence of maya, we enter a state of spiritual amnesia where we forget our eternal spiritual identity in relationship to God. In this state of forgetfulness, we try to seek pleasure in a reality which the Buddhist philosopher Nagarjuna aptly described as sunya or empty: a reality where all truths arise and exist in dependence upon other truths. I couldn’t help but agree. Srila Prabhupada’s rendition of this ancient text was not only far more lucid than any Buddhist presentation I had read but it answered the questions which Buddhism did not. Compelled by Prabhupada’s presentation, I decided to commit to bhakti-yoga: the practice that helps revive our loving relationship with Krishna , the infinitely attractive source of all that exists. In early 2006, inspired by my mentor Mahavana Dasa, I started studying the Srimad-Bhagavatam, the graduate study to the Bhagavad-gita. In it I further discovered detailed descriptions of both the material and spiritual realities. In my search for truth, I hadn’t encountered anything as comprehensive as what the Bhagavatam presented. I had to travel halfway across the world to discover what was under my nose all along: India’s glorious spiritual heritage. For allowing me to discover the essence of India’s timeless wisdom culture, I remain eternally indebted to my spiritual teacher His Holiness Devamrta Swami. His vision and hard work established the outreach culture which attracted me to Krishna . My familiarity with Hindu temples bordered on indifference. It is unlikely that I would have stepped in to a temple of my own accord. But Krishna , through the Bhakti Lounge (formerly Gaura Yoga) community, mercifully allowed me to connect to Him anyway. Bhakti Lounge is one of a number of urban outreach centres that cater mainly to a youthful western audience increasingly apathetic toward religion and religious institutions. Even though I was not apathetic toward religion, I was certainly apathetic toward what I had encountered in the name of Hinduism. Without studying Srila Prabhupada’s books I would have remained so. In 2009, I got engaged to Karuna Purna Dasi. 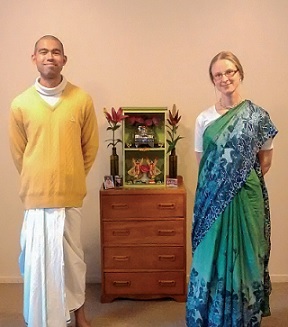 Hailing from Sweden, she was travelling in New Zealand, searching for a higher purpose in life, when she met the Krishna practitioners at Bhakti Lounge. We got married in 2011. Though maintaining a Krishna conscious lifestyle in a blatantly hedonistic urban environment is not easy, we reap the benefits of living in a community dedicated to sharing Krishna consciousness in a dynamic and relevant way. Most of our evenings are spent at Bhakti Lounge, where we facilitate workshops on various aspects of Krishna philosophy. I also write for and help edit Enough! magazine. Through relevant content and contemporary visual style, this magazine tries to show that misdirected desire is the root cause of the myriad global problems. When we desire to seek pleasure in transient matter, we are put under the control of maya, Krishna ’s energy of ignorance. Overcome by lust, anger and greed, we repeatedly try to seek happiness in a place where there is none. In the process, we wreak individual, social and environmental havoc. Our desire for pleasure is our essence. This desire cannot be annihilated but it can be redirected. Sri Caitanya Mahaprabhu, the most recent incarnation of Krishna , came to teach us how to do that. Appearing in Bengal, Mahaprabhu inaugurated the scripturally prescribed spiritual technology for this age: the chanting of the Hare Krishna mahamantra. By a systematic and sustained practice of this chanting, we can revive our eternal loving relationship with Krishna . Experiencing inconceivable nonmaterial happiness is a by-product of this reawakening. When we experience authentic spiritual pleasure, we automatically relinquish our feverish attempts to enjoy and exploit the world of matter. In this state of consciousness – Krishna consciousness – we can be a healing presence on this planet. Cultivating this consciousness is the only genuine solution to the world’s problems. I am grateful to be part of a global community aspiring to be part of this solution. Saci Dulala Dasa first read the Bhagavad-gita As It Is in 2005 while completing a Masters in Environmental Studies. Finding Krishna ’s teachings rational and relevant he committed to the practice of bhakti-yoga soon after. Obsessed with books since young, most of his time is devoted to writing about the intersect of life and Krishna philosophy. He and his wife live in Wellington, New Zealand.